Pre- and in-service teachers get what they need to connect with adolescent students—and to help them connect with good literature—in this engaging, balanced look at the world of young adult literature. Here readers get foundational knowledge combined with a look at the pathways leading to the literature itself, to begin to open the door to exploring young adult literature. 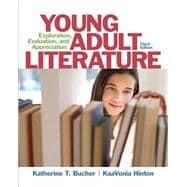 Brief enough to give readers the opportunity to read the books themselves, yet comprehensive enough to ensure that teachers truly understand adolescents, their literature, and how to connect the two, Young Adult Literature by Bucher and Hinton provides what’s needed to ensure a rich educational experience for adolescents, while nourishing their love of reading. Professor Emerita of Educational Curriculum and Instruction at Old Dominion University, Dr. Katherine T. Bucher has written several books including Teaching in the Middle School (2011), Classroom Management; Models Applications and Cases (2012), and co-author (with Tami Craft Al-hazza) Books about the Middle East (2008). Dr. Bucher has also written numerous articles and book chapters. In 2008, she retired from the Department of Curriculum and Instruction at Old Dominion University in Norfolk, Virginia, where she served as assistant department chair and graduate program director for the school library program. KaaVonia Hinton, PhD, is an associate professor in the Darden College of Education at Old Dominion University in Norfolk, Virginia. She is the author of Angela Johnson: Poetic Prose (2006) and Sharon M. Draper: Embracing Literacy (2009), and co-author (with Gail K. Dickinson) of Integrating Multicultural Literature in Libraries and Classrooms in Secondary Schools (2007) and (with Sueanne McKinney) Mathematics Literature in the K-8 Classroom and Library (2010).